Until today, I thought these were lima beans. 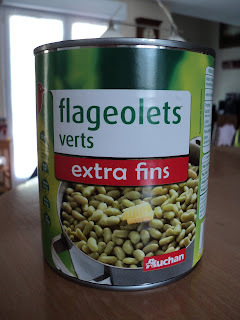 But the translation for flageolet is flageolet and they are somehow different. To me they look and smell like lima beans, they have the same texture as lima beans, etc. but apparently there is some slight something that's not the same. My kids often eat these in the canteen, because I don't think to buy them. Not on my radar. We got this can in the supermarket basket we won last week, and I thought them to be a rather odd addition, thinking at the time, "Who likes lima beans?" But then I remembered, as I was searching for a veggie to go with lunch. "Who wants lima beans?" I got two out of three mois, and quite enthusiastic ones at that. Bernard offered to fix them up with cream and garlic and he and Alex were quite happy campers, gobbling them up like caviar. Ellie, while stating that she didn't like them, still ate them all.